The Carmelite Studies section of this website provides information about academic scholarlship into the history and spirituality of the Order. An overview of key historical periods and scholarly projects is given on the pages of this section (see the menus left or right). Some pages provide access to articles which open in PDF format and require a reader such as Adobe Reader. Articles can also be viewed arranged by author. What is meant by "Carmelite Studies"? The field of Carmelite Studies embraces a wide range of disciplines that include the distinctive spirituality of the Carmelite Order, the history of the Order, and the development of different traditions associated with the Order, studies on the many significant figures belonging to - or associated with - the Order, and the contributions that individual Carmelites have made in a wide range of fields, especially Scripture studies, philosophy, literature and art. 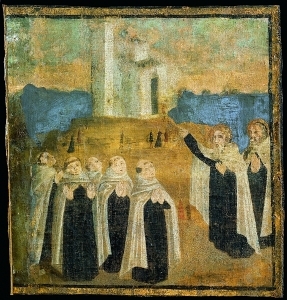 Although Carmelite Spirituality is only one element of Carmelite Studies, it is probably the most developed area within Carmelite Studies as a whole and the expression 'Carmelite Spirituality' is sometimes used as a 'catch all' term that includes all the other branches of Carmelite Studies. In recent years there has been a significant growth of interest in the field of Carmelite Studies among those who see themselves as belonging to, or being associated with, the many different expressions of the Carmelite tradition that have emerged in the course of its 800-year history.